Vermont is world-famous skiing destination, you probably know that. But were you aware that this small mountainous state has 19 alpine ski resorts? That’s a lot of skiable terrain for a the eighth smallest state in the country and can make it can be bewildering to choose which is best for a family ski vacation, especially since many of the resorts are fairly close together. But the fact is, that in spite of its small size, Vermont offers a wide variety of resorts from old-school with minimal grooming and few amenities to super high-end luxury where the passes are paperless and scanner activated. Happily, Ski Vermont realized that it might be difficult for families to figure out which resort is the right fit and responded brilliantly by calling on a cadre of skiing parents – the All Mountain Mamas – to come to the rescue. In the interest of full disclosure, I must reveal that I write for the All Mountain Mamas site and that Ski Vermont is one of the Back to Ski Week sponsors this year. But this is a case of me getting drafted for my dream team. I grew up skiing in Vermont and still think it is one of the finest places in the world to head for a family ski vacation. In fact, I spent years promoting Vermont as a family ski destination on my personal blog before anyone every gave me a nickel. So it is with both the endorsement of sponsorship and proud humility that I share what I consider yet another really great resource for skiing families. Let’s take a look at what the All Mountain Mamas site has to offer, shall we? Probably the best thing about the All Mountain Mamas site are the mamas (and the papas and kids who take trips with them). 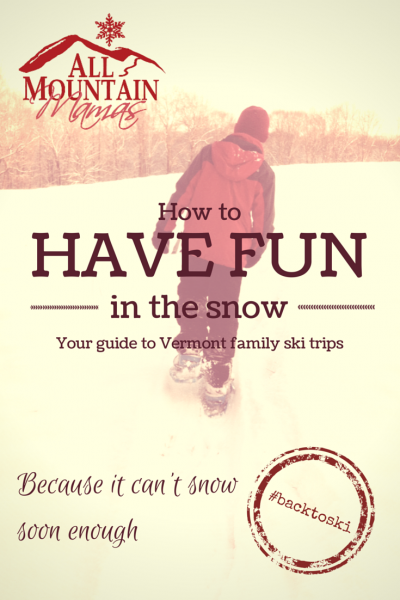 The content on this site is written by real moms who take Vermont ski trips with their families. None of us are professional or Olympic skiers or riders; none of us ride private jets or chauffeured limos to the mountains. We’re all just ordinary parents who happen to love spending time outdoors in the winter. That means the resort reviews on the site are written with families in mind. 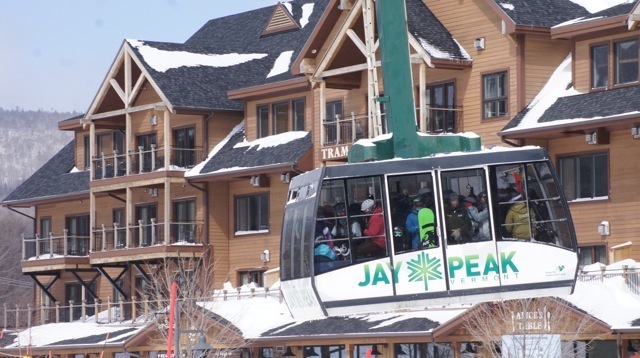 They offer advice about the best places to stay to get to the lifts first thing in the morning, tell you just how pricey the on-mountain dining options really are, and give insight into the ski schools from a firsthand perspective. The mamas take into account each resort’s distance from major metropolitan areas, what the terrain parks are like, and how challenging the trails are for different ability levels. If you are planning a Vermont ski area vacation I definitely recommend checking out the Visit section of the site to see what resorts have been reviewed (new ones are added throughout the season); these posts will give you a great overview to help you start making your plans. We all have kids that are different ages and ability levels as well, from toddlers through teens. That means a broad perspective on what makes resorts fun for different kinds of families. A quick Internet search for “kids’ ski socks” reveals that there are myriad options out there just for covering your children’s tootsies, let alone the rest of their bodies. But how do you know which socks are the best? Each season the mamas check out different gear, from socks and mittens to hats and skis and write about how well they held up under real conditions. But beyond looking at specific brands, they also talk about what you should look for in the gear that you need to purchase so that you can make informed decisions about important things like what size ski helmet to purchase and what you need to outfit your first-time skier so he or she will be comfortable. It’s like getting to peek inside the ski bag of a good friend – without having to discover the two-year-old unwrapped granola bar and unwashed long underwear. 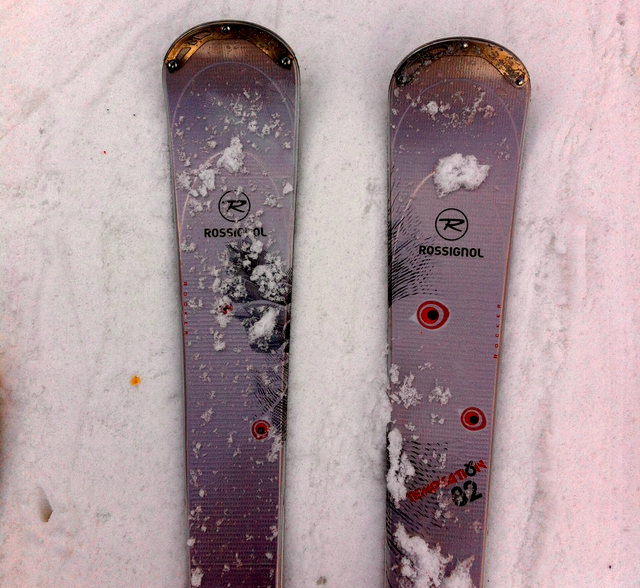 If you’re a family that skis than you love cold snowy weather. But that doesn’t mean you love to drive in it or always know how to dress for it. A goal of the mamas is keep it real with topics like driving in the winter or dressing your kids for really cold days. And it’s just possible that we may spend a little time in the spa as well, you know, in the interest of authentic research. Much as we love Vermont in the winter, it’s also a pretty nice destination at other times of the years as well. That’s why the site also covers activities and camps during the spring, summer, and fall. The site is less than a year old, but eventually will serve a the ultimate four-season guide for families looking to plan and execute a Vermont mountain vacation. With an enthusiasm for the Green Mountain State and an honest friendly tone, the All Mountain Mamas is an exciting addition to the world of family skiing.